An article that appeared in the April 2011 issue of the Industrial Worker that explains that direct action isn't solely used for its effect on 'bread and butter' issues. Also takes up the question of contracts. 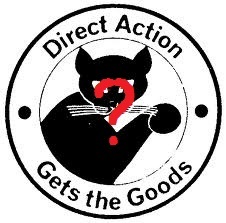 The old slogan goes “Direct action gets the goods!” This is sometimes true, it depends. Obviously, not all direct action gets the goods. That is, direct action is not a guarantee of success. Just as obviously, sometimes people get the goods without direct action. It’s undeniable, though, that in some settings direct action really is the best route to success. Sometimes direct action really does get the goods. But who cares? Who wants goods anyway? Let me put it another way. I used to argue for non-contractual workplace organizing, or “solidarity unionism” as we usually call it, in the following way: If you’re strong enough to get a good contract, you don’t need to go for a contract. If you have the organization to get what you want via a contract, you can get it without a contract. Good contracts that contain real gains are the result of good organizing. You get a good contract when you have a dedicated, well-organized group of workers with good tactics and strategy. If you have all that, what do you even need the contract for? The basic perspective here is that you don’t need recognition or a contract—you can get just as much or perhaps even more without it. That’s false in at least one important sense. One of the things that goes along with contracts and recognition is an agreement that limits (or, an agreement to limit) the struggle. In the United States, the National Labor Relations Act (or the Wagner Act) explicitly argues for unionization as a way to maintain labor peace. No strike clauses and similar things express this idea as well. That agreement is worth something. Imagine two different groups of workers in contract negotiations with their employers. Imagine that there is basically no difference between these groups, their work, and their employers. One group of workers wants a contract that does not contain a no-strike clause. The other group is not concerned with that. Other than this difference, the groups are basically the same: well organized, serious, etc. Let’s say they both succeed. All things being equal, the group that gets a contract without a no-strike clause will probably come out with less other gains. The group with the no-strike clause will probably have a contract with more other gains. That is to say, the no-strike clause is worth money. Refusing it will come at a cost; accepting it will come with benefits. The IWW is a radical union. As radicals, we are generally motivated by morals and emotional impulses that make us care about other people—that’s part of why we’re radicals. Of course, we want people to have better lives. But people having better lives is only sometimes an issue for radicals. Radicalism is not simply “we want people to have better lives.” There are non- and anti-radical ways to get better lives, for some people. My point is that “getting the goods” is not the most important goal. If asked why we should we focus on direct action, our answer should not be “because it wins more stuff, more often.” Not only is that not always true, even if it was true that would not be sufficient to recommend it. Let me try another hypothetical example. Imagine that the global economy recovers in a big way. Prosperity is the new order of the day. A rising tide begins to lift most boats. There are increasing opportunities for electoral politics and in the United States, National Labor Relations Board elections begin to genuinely improve many people’s lives. In that case, we could “get the goods” in a variety of ways other than direct action. Would this change how we orient toward electoralism and recognition? I would say no, because our main motivation is not getting the goods. We don’t just want more under capitalism. We want a different type of society. In order to get to a new society, we want more people to be class conscious and committed to creating a new society. We should not care about direct action because it gets us goods. It doesn’t always, and besides, with the time it takes to organize, people could probably get more goods by putting that time into a part-time job. We should care about direct action because direct action moves more people closer to class consciousness and commitment to having a new society. We should care about direct action because direct action moves more people closer to class consciousness and commitment to having a new society.